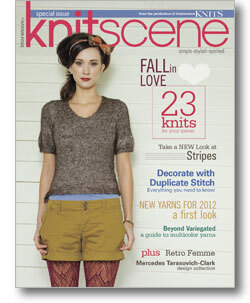 Knitscene Spring 2012 is packed with brand new knitting patterns. Play with hand-dyed yarns, explore texture, add duplicate stitch embroidery--there's something for every knitter in here. Knitscene Spring 2012 is Here! Fall in love with Knitscene all over again with 23 new knits, from novelty accessories to need-to-have wardrobe basics with fresh new twists. Designer Collection: meet designer Mercedes Tarasovich-Clark, learn about her path as a successful knitwear designer, and knit three of Mercede's new patterns! Selfishly Striped: Knitscene asked designers Kate Gagnon Osborn and Courtney Kelley what they would like to design for themselves, and the answer is stripes! Knit the cardigan, cowl, hat, and tee, all happily striped. Beyond Variegated: learn the best tips, tricks, and uses for multi-colored yarns, plus the difference between handpainting yarn, self-striping yarn, and dip-dying yarn. Six Mandolin Lane: visit Six Mandolin Lane, where you'll find a little white house, knits with quiet charm, and yarns with delightful dye. Covered in Color: when looking at a piece of plain knitting, have you ever seen potential for a stripe, motif, or image? It’s easy with duplicate stitch! Learn the secret of adding bold and beautiful color accents. Oh. Ecru. : knit a handful of lovely neutral garments with elements of perfect lace and drape. from urban to retro to sleek to sweetheart—something for every knitter!